Here’s a photo from the PhazyLuckers appearance at the Festival Chatô-Bruyant (Geneva) in July last year, which nicely shows the rig I was using that night. I used my Billy Morrison Les Paul for this gig, running into the “version 2” of my Big Board (read about this pedalboard) and my 2010 Dual Rectifier. Although I have exactly the same 4×12 cab as shown, the one used was shared with one of the other bands on the bill. Actually, looking again at the photo, it’s quite possible that this is a standard sized cab (I think they call it the Traditional nowadays) and not the oversized “Rectifier” version that I own. Regardless, it sounded good from where I was standing. The cab is miked with a Shure SM57. Looking at the mic position, the sound must have been quite dark (the mic is positioned well away from the speaker cone), which I prefer actually. Got some good comments about the overall sound after the gig, so no complaints from me. You can just about make out the Pedalsnake which connects the amp input, and FX Loop send and return jacks, to the pedalboard. I think the Pedalsnake is probably the best bang for buck I’ve spent on music gear. It’s rugged, adds no appreciable noise or tonal coloration, and makes set up and break down very quick and easy. I can’t recommend this product enough. 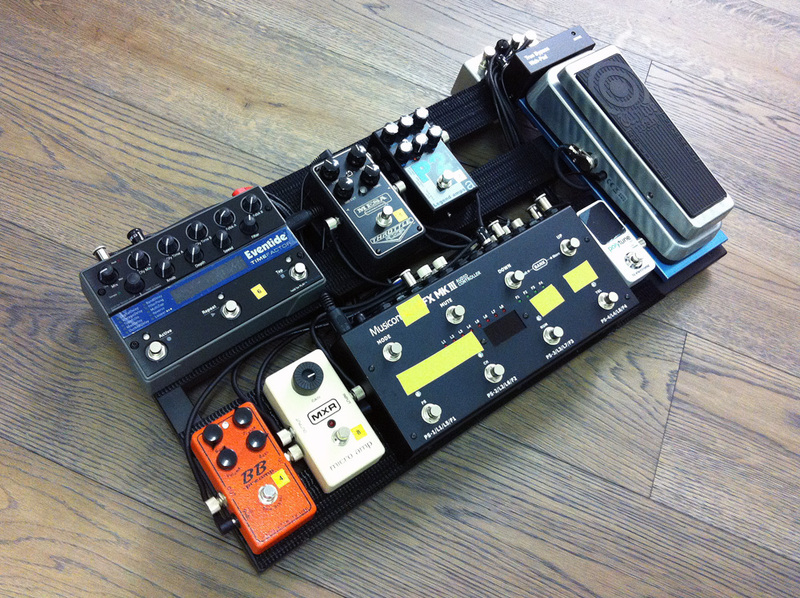 Here’s the pedalboard that I used that night. As usual, all distortion was provided by the Dual Rec, so neither the Mesa Throttle Box nor the AMT P2 were used. Those who follow my blog might be wondering why I’m not using my rack rig and Relay G90 wireless. Well, frankly, on such a small stage it’s more hassle than it’s worth and doesn’t give any practical benefit.